More than 1,300 people, many of whom have disabilities, are living in nursing homes for the elderly, despite being under the age of 65. Michael McGealy has spent close to a decade living in a nursing home as appropriate accommodation cannot be found for him. He entered the home in north Dublin in 2009 on what he thought was a short-term basis. Speaking to RTÉ's News at One, he said despite discussions with the Health Service Executive since his case was raised last year, he remains in the nursing home. 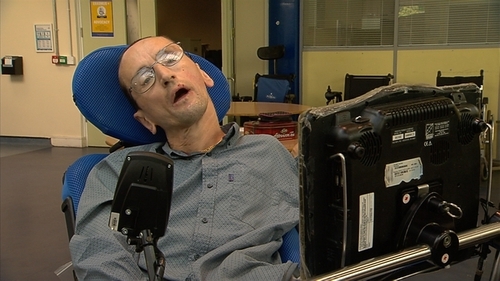 Mr McGealy, who is 46, said that he just wished to live with people his own age. A formal letter of complaint about his case has been sent to the HSE. Under the United Nations Convention on the Rights of Persons with Disabilities, which Ireland recently ratified, housing is not just a wish but a right. The HSE has said as of 30 June this year, 1,313 people under the age of 65 years were accessing Nursing Home Care via the NHSS scheme in public and private settings. That is 91 more people than this time last year. The organisation said it was aware a number of these people wish to live independently with appropriate supports. It has said it was working with community health organisations to facilitate this, but it said resources were finite and regretfully people will sometimes have to wait for this wish to be facilitated. The Minister of State with responsibility for Disabilities, Finian McGrath, has said he believes such environments are entirely inappropriate for the day-to-day living of people with disabilities. He said while he cannot comment on individual cases, he is supportive of persons with a disability living where they wish, subject to safety and clinical considerations. Mr McGrath added that the HSE "is committed to providing supports to people to live in the community, subject to availability of appropriate housing and clinical considerations in the context of available resources".